Zen teacher Haemin Sunim describes with great clarity the suffocating effect of perfectionism and how damaging it is to think your worth as a person is dependent on how well you perform. Then, shows you page by page how to reclaim your freedom and your life. Hearing the words 'be good to yourself first, then to others' was like being struck by lightning. Many of us respond to the pressures of life by turning inwards and ignoring problems, sometimes resulting in anxiety or depression. Others react by working harder at work, at school or at home, hoping that this will make ourselves and the people we love happier. But what if being yourself is enough? Just as we are advised on airplanes to take our own oxygen first before helping others, we must first be at peace with ourselves before we can be at peace with the world around us. 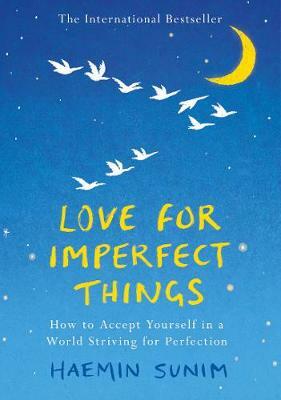 In this beautiful follow-up to his international bestseller The Things You Can See Only When You Slow Down*, Buddhist monk Haemin Sunim turns his trademark wisdom and kindness to self-care, arguing that only by accepting yourself - and the flaws which make you who you are - can you have compassionate and fulfilling relationships with your partner, family and friends.